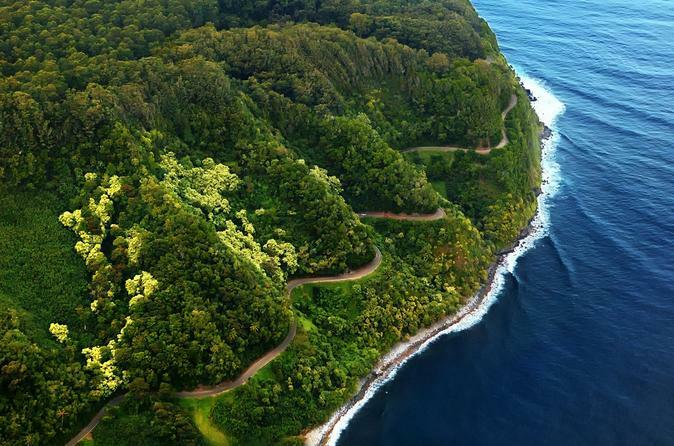 Kaumahina State Wayside Park* Scenic views of Maui’s rugged & windward coastline of lush tropical rainforest. Pua`a Ka`a Wayside State Park Verdant tropical rainforest with breathtaking waterfalls and glistening pools. Keanae Lookout* Get one of the most famed views of the Road to Hana from the rocky black lava coastline which is home to Hawaiian taro fields and a great place to enjoy local treats like Banana Bread. Wailua Falls Get great photos of the Road to Hana’s most impressive waterfall! Wai`anapanapa State Park* Means “Glistening Fresh Water” in Hawaiian, this pristine black sand beach has lush tropical foliage, fresh water streams, caverns with sparkling pools, and great photo opportunities. “Heavenly” Hana Town Maui’s charming and rustic town which is home to the island’s largest Heiau (Hawaiian temple), exotic flowers, rich history, a famous general store and more. Palikea Stream The largest perennial stream on Maui. Waikani Falls Known as “3 Bears Falls” with three parallel waterfalls dropping from as high as 1000 feet! Charles Lindbergh’s Grave* Burial ground of prominent aviator, inventor, explorer, author, and activist Charles Lindbergh. In 1927, Lindbergh became the first person to make a non-stop solo flight across the Atlantic Ocean.